Small changes can help to reduce your energy bills, save you money and the environment. Here are some simple changes that can make you more environmentally friendly. Change a light bulb – Changing your light bulbs to compact fluorescent bulbs (CFL) is an easy way to save energy. 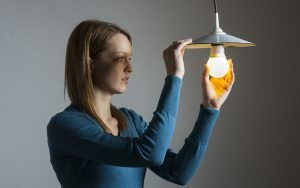 By doing this, you will consume 75% less electricity, and your bulb will last ten times longer. Unplug things that glow – Anything that glows when you turn it off are using power. This includes items like your TV, cell phone charger, and printer, It is advisable to unplug these from their wall sockets and plug them into power strips instead. Recycle your electronics – In the US many people throw away their old electronics. This has caused an increase in chemicals and heavy metals on the ground. Instead, look at the Consumer Electronics Association’s mygreenelectronics.org website to find recycling resources in your area. Audit your energy – You can ask your utility company for an energy auditor, who will visit your home for free or for a low cost. He/ she will be able to tell you where your energy is used the most, least and what you can do to reduce your energy bills. Support local farmers – Instead of traveling long distances to buy your groceries, choose to buy them from local farmers in and around your home.